Students at Korea International School are helping solve world hunger. 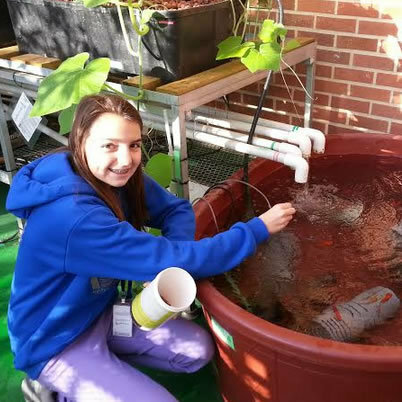 Through innovative greenhouse projects, middle school students at KIS are investigating agricultural technologies that may help provide adequate food for the world’s needs. They are conducting research to understand food supply issues in a greenhouse on the KIS Pangyo campus in Gyeonggi Province. This began two years ago when KIS middle school science teachers attended a Project Based Learning training presented by the Buck Institute for Education based in California. Four teachers ― Tara Verenna, Jason Martin, Lloyd Clark, and Matt Tyrie ― decided to change the science program to give students a deeper understanding of science through Project Based Learning. The teachers brainstormed how to involve students in real world issues as they learned science principles, and they selected the topic of world food supply. Based on that topic, KIS sixth grade students were presented with the driving question, “How can we grow enough food to feed the world?” All the students then came up with different ideas. They then used a process called “Need to know” to analyze each idea and home in on truly viable solutions. The two solutions selected were aquaponics and hydroponics systems. Following this, materials were purchased and complete systems built to grow a number of herbs and vegetables. Three systems with different approaches were built by weekend and evening volunteers. Two systems were aquaponic using tanks with fish and water circulation pumps to provide nutrients for the plants. The third system used a hydroponic approach which provides nutrients to the plants through circulated water but without fish. Both systems provide efficient, organic methods for maximizing healthy food production in a small space using limited amounts of water. 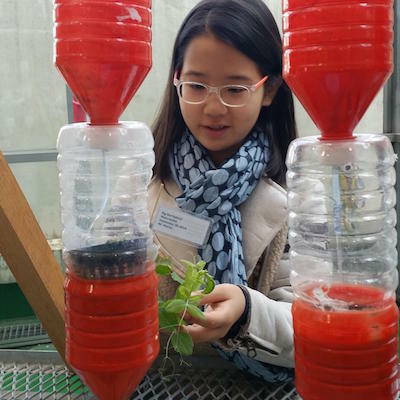 Students are excited and fully engaged in the greenhouse project which is being documented in a blog (jpmoverseas.blogspot.kr). Students have contributed most of the recent updates to the blog which tells the story of the project from start to the present. Many visitors have come to the school to see the greenhouse and to hear from students about their learning. Students typically conduct the visitor tours with pride. Middle school teacher Tara Verenna said, “When these kids think back to their middle school career, this is what they are going to remember.” Along with their learning about science and global issues, student will no doubt remember actually taking home beautiful cucumbers, squash, beans and herbs to eat. This project is part of a schoolwide emphasis on hands-on learning using real world projects. This emphasis is intended to develop 21st century skills such as creativity, innovation, problem-solving, critical thinking, collaboration and global awareness. KIS is committed to helping students be ready to change the world positively and solve future problems. This has led to an increased emphasis on science, technology, engineering, and math in real world contexts, and an approach sometimes referred to as STEM. It has resulted in more experiential learning and out-of-the-classroom activities such as the greenhouse project. This requires some retraining of teachers and redesign of curriculum. “Not all teachers can think outside the book,” commented Jason Martin, the middle school department head. However, at KIS this way of teaching is becoming common and expected. Coming years will offer many more opportunities for STEM projects and relevant real-world activities for students. KIS has developed this focus in several other ways including annual seminars and classroom involvement with MIT students who spend a month on campus working with students. In addition, opportunities to learn computer programming at all grade levels and to develop engineering projects in workshop spaces are being developed continuously. Korea International School will host Spring Open Houses at Pangyo Campus and Seoul Campus. For more detailed information, please contact the KIS Admissions Office at 031-789-0505 or visit school website at www.kis.or.kr.